This picture is so awkward. The guy on the right has so clearly just done what Jake is doing and come to the same conclusion. There is no reason why Emmy Rossum should whore herself out like that. 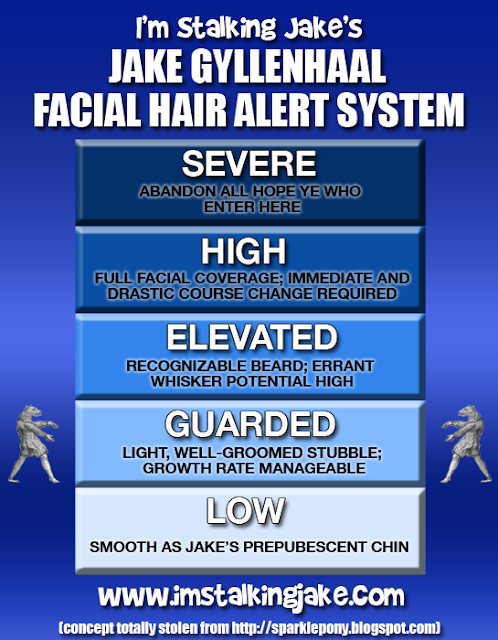 WELL WELL, as long as I Heart Jake has dagger-of-timed itself back to 2004 (see yesterday's post), let's enjoy some more pictures from this year of epic Jake disaster movies and talk about how in those days Jake's Facial Hair Alert Level was merely Guarded. Cue the over-the-top photocall laughter! Speaking of Blingees, are you still wading through all of them?! How come The Day After Tomorrow is a "Jake Disaster Film"? I watched it...granted it was sort of lame, but I wouldn't classify it as a disaster. I mean, mediocre at best, but still entertaining. Or am I missing some seriously obvious point that I will face palm later for? P.s. Did you get my submission for the blingee collage? KD - Have you ever seen TDAT? The entire movie is based on global disaster. I think you may be applying the word "disaster" incorrectly, dear. I did get yours, KD! 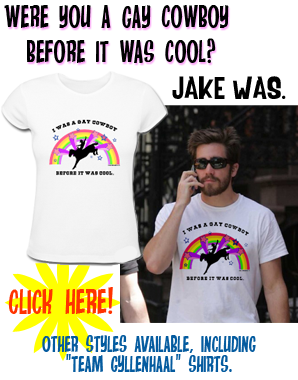 And I got all three of yours, gyllenhaalisgr8! :D I have 22 (wait, make that 23, thank you Jake's bad dream!) in all, but every time I recount through the e-mails and comments, I only come up with 21 (now 22). So...er...I appear to have conjured one from the ether or something. Oh, PG, these pics are priceless. I love that, "over-the-top photocall laughter"! & Emmy was all of what, 17 at the time??? Not even totally legal, ha! 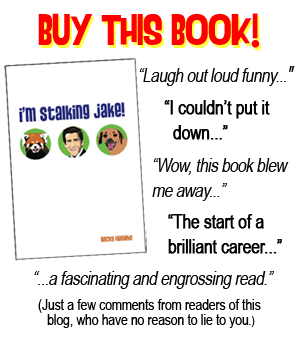 Jake, you naughty boy, you. Heheheh, but boys, ehem, that is, MEN will be boys, eh? But regardless of said suspect impropriety, he still looks REALLY good in these once again, "new-old" pics. Love that scruff way better than the clean shaven Gylls. I sure hope SOMEONE, (hint to Mo here), made a blingee for us out of that "superhug" photo from way back when. I wanted to, but I got nothin'. It can't be too much of a disaster cuz FX is like ALWAYS playing it. You're psychic, Vanessa. I had one made but my boss walked by and I closed the site. :[ I'll try to reconstruct my "masterpiece". I always thought that they were cute together. I was so confused for a while, as you kept referring to it as a disaster movie, and my brain some how placed an 'of a' in between. And my confusion sprouted from the fact that I thought the movie was pretty good. LOL.